1. T2 is a high voltage flyback transformer salvaged from an old TV, or ordered from Fair Radio Sales (see Where To Get Parts). Look for the biggest, most intimidating transformer you can find. Old tube TV’s are a good place to look. The transformer should not have a rectifier built in. 2. You will need to rewind the transformer’s primary. First, remove the old primary, being careful not to damage the high voltage secondary. If the transformer is wound with all windings incased in plastic, use another transformer. Second, wind on 5 turns of 18 AWG wire, twist a loop (center tap), and then wind on 5 more turns. This becomes winding C-D. Now, wind on 2 turns of 22 AWG wire, twist a loop, and wind on 2 more turns. This becomes winding A-B. 3. Q1 and Q2 will run HOT if not used with a large heatsink. After the circuit has been running for a minute or two, you should still be able to put your finger on the transistors without being burnt. Also, R1 and R2 will run hot. 4. If you experience arcing on the exposed transformer leads, select a lower voltage for T1. If you are powering the circuit with a power supply (see Power Supply), just crank down the voltage. 5. For a real high voltage output, connect a voltage multiplier (from an old TV or computer monitor) to the output of T2. 6. 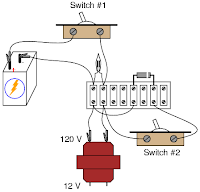 If the circuit does not work, reverse connections A and B. 7. I finally got around to taking some pictures of the circuit in operation.